LOCAL PET STORE HAD A BATCH OF BABIES GIVEN TO THEM SINCE THEY WERE A FEW HOURS OLD. 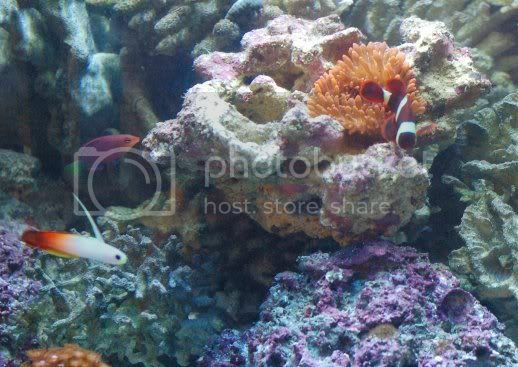 THEY WERE PUT STRAIGHT INTO A TANK WITH CORALS AND A LITTLE LIVE ROCK. THEY HAVE NOT FED THE BABIES AND TELL ME THAT THEY DON'T NEED TO BE FED SINCE THERE ARE SO MANY 'NOO NOO'S' THAT COME OUT OF THE ROCK AT NIGHT. I HAVE WATCHED THEM GROW AND FROM A BATCH OF 20, ONLY 5 WERE LOST IN THE FIRST WEEK. THEY ARE NOW 6 WEEKS OLD, GROWING RAPIDLY, AND LOOKING HEALTHY. AFTER READING THIS FORUM AND LEARNING ABOUT ALL THE FUNNY THINGS AND HASSLE I HAVE TO GO TO IN ORDER TO CULTURE FOOD FOR MY FUTURE BABIES (MY MALE HAS A MOUTHFUL), I AM TOTALLY CONFUSED. ANY EXPLANATIONS OUT THERE? ANYONE HAD THE SAME SUCCESS? I've never raised them, but know some people who do. I believe the fry must be separated from the parents. Plain old LR (especialy in a newly set up tank) will not have enough pods and microfauna to sustain the babies 9or many of them, at any rate). You will need to supplement with rotifers and BBS. There is LOTS of info online about breeding them. Well if you type MOFIB in a yahoo search and go there you'll learn everything on breeding marine fish also I am a banggai breeder and I breed copepods, amphipods, mysis shrimp, bristleworm's, and several other zoo plankton's simple work. It sound's like there must have been a ton of copepod's and zooplankton in this tank with the babies in order for them too feed and survive I am testing a few similar setting's with my banggai's only using a tank with Cheato and seeding it 6 month's prior to any babies entering the tank and feeding it daily with live phytoplankton to keep the zooplankton alive. My babies now, I feed them newly hatched I mean right when they hatch baby brine shrimp with there yolk's still attached for all the nutrient's and copepod's naupali. Some people use cyclop's with selcon and thaw it and add to a grow out tank with a fake urchin and bare bottom tank to siphon out leftover food. Just remember you'll loose a ton of babies no matter how much you research before you get it packed and get accustom to 3-4 feeding's a day. I personally will probably never breed bengaii as they are a fish (dont ask on that one) but they are a gateway breeder as I consider it... soon you'll be trying your hand at gobies and god knows what... save your buckets... they come in handy!! In edit, I use an enteral feeding pump (found on ebay pretty cheap) to provide a constant drip of live zooplankton (typically cultures of rotifers and copepods) to my larval tanks when I'm experimenting with my crabs, this allows constant feeding with little interaction, you may want to look at that as a resource. Whileit wont feed large foods, it willworkforthe smaller morsels. Our LFS had a pair in his 225 or 250 gallon DT and they spawned at least twice before he sold them. He never fed the fry anything special and still had a few survive. Obviously this is not optimal but I can see how a batch might could live off the pods in a tank with just corals. Mofib is a great source of information I am a moderator there for Banggai breeding and very happy at a lot of progress the organization has done with all sort's of Saltwater fish being successfully breed and raised your all welcome to come by and sign up anytime. I never heard about this forum and its totally provide everything i think so . I heard the most beautiful words come out of my girlfriend's mouth last weekend!